Sea water is eroding land and causing landslides on Phu Quoc Island in the southern province of Kien Giang. Authorities are seeking ways of coping with the intrusion, which has even affected wells on the island, including one belonging to the Weather Forecast Bureau in Duong Dong Town. Head of the bureau Nguyen Van Hung said that the well, which was more than 50 metres in depth, was drilled 13 years ago. Formerly, it was full of pure, clean water and supplied dozens of local households. However, now the water is brackish and undrinkable. Many other wells on the island are also affected, creating problems for residents, said Hung. Landslides along some coastal areas have created dangerous obstacles for locals. People living in residential quarters No 3, 6, 9 in Duong Dong Town are anxious about landslides during the storm season from May to October. Phu Quoc Island authorities have no exact statistics on the number of landslides and places at high risk, but they are developing plans to move threatened villagers to safe areas. A typical example of the problem is displayed at the house of Huynh Van Bo in residential quarter No 9.u7,k The walls have cracked wide open due to land sinking and landslides. Bo said that residents had invested a lot of effort and money to build embankments to limit the movement of earth. "However, it is only a temporary measure and will not ensure safety in the long term," said Bo. Meanwhile, Phan Van Trung who lives in Ganh Dau Commune said that in the past two years landslides had uprooted many casuarinas. 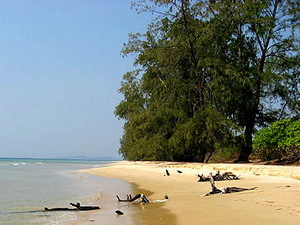 To cope with the issue, Phu Quoc authorities have called upon local residents to plant more trees and to keep the seashore clean. The island has sped up the development of a new residential quarter to move householders from dangerous areas.